Love you, too, Jules. And thanks for sharing my addiction. From someone who moved away from here for 25 years … I can only say a written Thank you to the Heroine who saved your life.. Now comes my understanding of where you zest for life was “fine tuned” and how you became such a happy, loving woman! Much appreciated, Kim. Life is fragile and friends are precious beyond measure. The amazing parents I have didn’t hurt my outlook any either! My heart just aches at the sorrow and is grateful for the heroine in Densie and happy that Donna is here to brighten everyone’s path that she crosses! What a beautiful thing to say, Sara. Thank you. You brighten my path, too!! Wish there was a “LOVE” button that I could click. I am so thankful for both of you and for the honor I have in calling you both my friends. 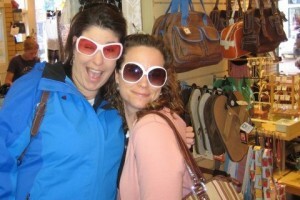 BTW, the glasses look great on both of you! The thankfulness and honor go both ways, Dawnie. 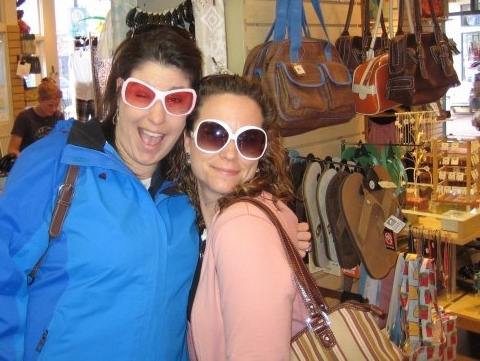 We’ve shared many-an-emotion at our girl getaways (in case you can’t tell from the ’07 escapade pic I chose for this post!) I’m grateful for the beauty in our unique and precious friendship. Reading this made my day Donna! I know you would have done the same thing if the tables were turned. I’m certainly glad that you survived and that we continue to have a great relationship. I do cherish our friendship! nice toes… love ya! All I have to say is WOW! God has fantastic plans and I’m glad to be able to read your thoughts. Love you guys! Thank you for sharing in the journey with us, Karen. You are loved. I’m with Dawn: LOVE button! I imagine that there isn’t a member of HL, that remember the events of that day, that doesn’t believe Denise was ALL of our heroine. Donna, I like I am sure many others, have often wondered through the years what life was like for you when the subject came up or a question was asked is regards to the accident. Thank you for sharing an intimate glimpse. Your thoughts, words, kindness, and support mean more than you know, De. I am so thankful to belong to such an embracing community. Well-said, Aim. I, too am grateful for our enduring, pick-right-up-where-we-left-off friendship. It is precious – T3! Love you, too! She’s my heroine too. Without her, I would never have had the chance to meet the woman of my dreams. Thanks Denise! Like honey to my soul, Honi! All life for me after age 16, including meeting you, my Love, was the gift Denise unwrapped when she stood up in the face of the impossible and said, “not on my watch!” So grateful. Agreed, Debbie! How could I read such an outpouring of love from De and not be overwhelmed with gratefulness and appreciation. My baby sister, you were only nine years old at the time of the accident, and yet your strength, unending love, and Tigger songs were such a source of encouragement (…still are!) I love you. Wow Donna, I am here at work fighting back the tears, I can’t even imagine what was going through both of your minds on that day, well all of your minds for that matter. Your words have brought alot of closure for me, I never really knew the entire story, I guess maybe I had but probaly tuned it out all these years. Dan was one of my greatest friends, his cowboy ways would melt my heart, I was kind of sad when he started wearing Hawaiin shirts and lost his cowboy image, it was like my childhood friend had grown up. I know that you would change every second of that day if you could and I know Denise would of did more if she could, you, she & Dawn are all amazing women and the bond that you all have with eachother will forever unbroken. Love hugs and kisses to all of you <3. Thank you for your thoughts and memories, Denise. They mean so much to me. …and Dan’s cowboy ways melted my heart, too! What an incredible story, Donna. Thanks for sharing this piece of yourself with the world, for allowing us to get to know you better, and for showing how heroic people can be in the most difficult and potentially life-threatening circumstances. You could have perished in that instant all those years ago, but, thankfully, someone was watching over you. We are all the luckier for that because of how you use your life to demonstrate the beauty of love, both through your relationship with Skip and through your blog. It’s great to know you. Your words – and the sincerity behind them – are kind and appreciated, Rick. It’s great to know you, too. So glad our paths crossed. As I scrolled through the dialog, bittersweet tears filled my eyes. Thank you for sharing that part of your life. Thank you, Stephanie. And thank you for reading. I remember you first telling me that story when we first started school together. I bet you retold it a thousand times that year and probably a thousand more since then. I’m glad you are here (and so therefore, Thank You, Denise). I’m glad we became friends our freshie year and are still friends today. Good to know that some things never change! Love you! I, too remember that night, Ape… laying on the tennis courts, staring at the stars, sharing life. You’re a good lady. Love you, too.